You've stocked up on orange and navy clothing (it's ok, everyone does it), you've printed out three copies of your schedule and even set it as your cellphone background (no shame), you've met your roommate, now what? During the hustle and bustle of move-in day and all the chaos surrounding it, it's hard to remember that the reason you're on Grounds is to, well, take classes. We've all been there. In the next couple of days, take some time to prepare for your first week of college classes to ensure that everything goes as smoothly as possible and you have fewer things to worry about. Get a planner (and use it! ): For the first few days of your first year, each dorm should be stocked with *FREE* UVa planners - take one! 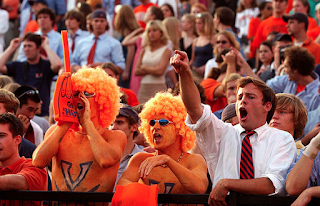 By keeping track of everything going on around Grounds - your classes, orientation events, and so much more - you'll find yourself a lot less stressed as you can plan ahead knowing what events are happening in the upcoming days (and trust us, there will be SO MUCH happening in your first few weeks at Uva!). Buy a couple of notebooks: If given the choice, most students will choose take notes on their laptops; however, some UVa professors prefer that their students take notes by hand. Before you know which professors allow laptops, come to class prepared to take notes in a notebook. After you've attend your first lectures, you'll know what to bring to each class to ensure you get the most out of your professors' lectures. Read your syllabi: Overwhelming at first glance, your syllabi can actually end up being one of your best friends all semester long. Familiarize yourself with the course materials, assignments, exam schedule, and even your professors' contact information. Plan to attend (at least a few of) your professors' office hours this week: Even though you won't have too many questions on course material after the first lecture or two, take advantage of having a little more free time this first week and introduce yourself to a few - or better, all! - of your professors in their office hours. As mentioned above, professors often print their contact information and availability on their syllabi, so mark down those office hours in your planner and make it a goal to attend as many as possible. Make a list of all the books you need (but don't buy them all at once): It's always a good idea to look up what reading materials are required for each class (search for your courses and the corresponding textbooks on the UVa Bookstore website), but often your professors will tell you exactly what you need and don't need to buy in their first lecture. Take a look at your course syllabi and purchase only the books used in the first few weeks of the semester. After that first lecture, purchase the rest unless your professor reveals that the material can be found online or that certain books aren't required. Walk through your classes: Explore Grounds and get to know your roommate a little better as you walk through your schedules before classes begin. Knowing where your classroom buildings are and how long it takes to walk from one building to another will make you much more comfortable come the first day of class! BREATHE! Don't let the unfamiliarity of college life stress you out. The first semester of college is all about figuring out how things work and meeting incredible new people who will make this big transition much easier. 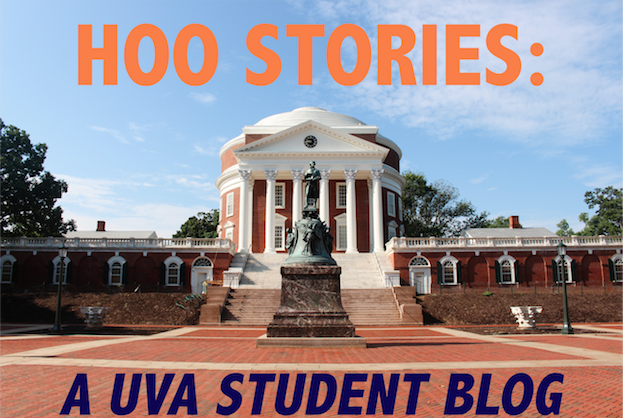 Don't worry if you get lost or are late to a class or two this week - you're learning the ropes and your fellow Wahoos are here to help you along the way! 1. Class of 20__ homepage: Most likely, the class of 2019 has already joined the Class of 2019 FB page, but it’s also very helpful to join other class pages as well. You can get important information from upperclassmen and get your own questions answered pretty fast on any Class Facebook group. From where a particular building is, to the best study spaces on grounds! 2. Free & For Sale: Trust me. This is a necessity to join. 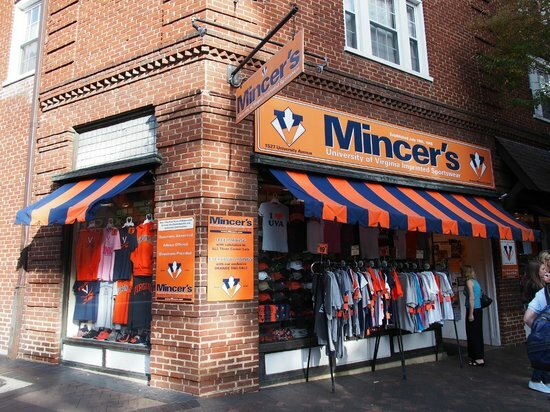 They sell everything here from textbooks to UVA gear to dressers. All usually for a fraction of the cost if you were to look elsewhere. Sometimes, if you’re lucky, a gracious student will be giving out items for free! Definitely make sure you join this group. 3. UVA Student to Student Textbooks: This page is solely dedicated to students trying to buy and sell textbooks. Textbooks are really expensive so this is a great group to join as well if you want to get those books a little cheaper. 4. Hoo’s Driving? Hoo’s Riding: This Facebook group comes in handy when you’re looking for a ride anywhere and everywhere from Charlottesville. Just post in the group saying that you need a ride to NoVA or somewhere out of state. Usually, a student is driving to that area. Just bring gas money and snacks for them and it really turns out to be a cheaper alternative than buying that bus ticket. And you might make a best friend on that 5 hour trip you need to take. 5. Jobs & Internships: A lot of students as well as employers post statuses with available job openings. Definitely a great Facebook group to check out. 6. GPA BOOSTER CLASSES: Just as the name implies, if you’re looking for some great classes to take that won’t be too challenging, take a look at this Facebook group. Move-in day is right around the corner! While most incoming first years spend the last few days of their summer stressing about where to store their mini fridge, what kind of shower caddy to buy, or whether or not their roommate snores, there are so many great things to look forward to in the first few weeks of the semester that these concerns will soon be forgotten. Moving in is certainly a rush, but once you've settled into your first year dorm take some time to plan for all of the exciting events coming your way! Convocation is a huge ceremony on the Lawn during which first year students are officially welcomed into the University Community. You'll hear from a few notable students and professors, T-Sully herself, and even be serenaded by an a cappella group or two. As per tradition, one lucky student will find a note from the 7 Society under his or her seat on the Lawn and read it aloud to the rest of the class. Convocation is one of UVa's oldest traditions and a semi-formal event. You should dress nicely, take plenty of pictures, and save room for T-Sully's ice cream social to follow the ceremony! 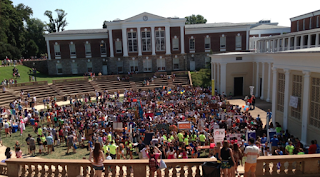 The Activities Fair occurs the day before classes begin and it's a wonderfully-chaotic event. 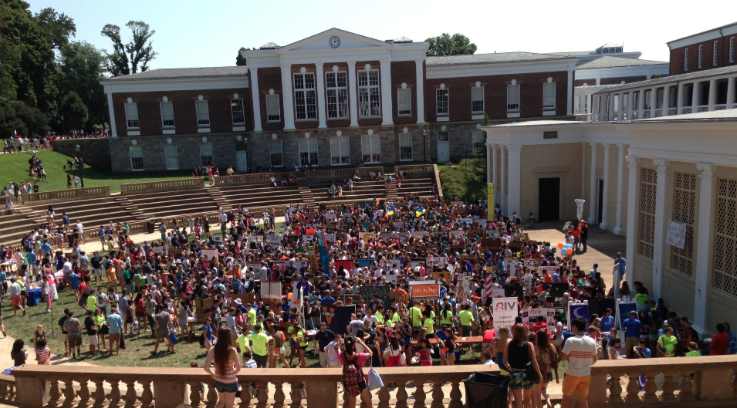 All of UVa's clubs (CIOs) fill the amphitheater and south Lawn with tables and posters, advertising their organizations. Whether you're interested in something whimsical like the tater tot appreciation club or something a little more serious like the Jefferson Literary and Debating Society, you're sure to find a club that fits your interests. Most students will sign up for nearly 30 different organizations, but end up committing to just a handful. Be warned, though: the more listservs you sign up for, the fuller your inbox will be this semester! Next to Lighting of the Lawn, Rotunda Sing is one of the best events to take place on central Grounds. 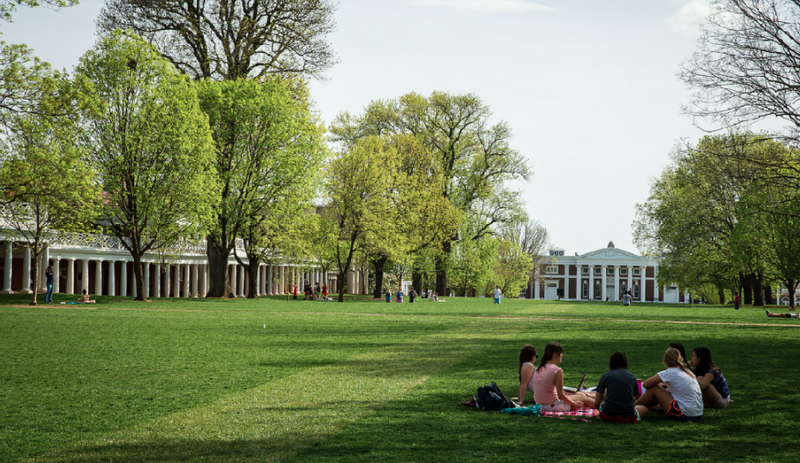 Here students will lay out on blankets and towels on the Lawn to listen to all of UVa's a cappella groups perform in front of Old Cabell (due to the Rotunda construction). Get to know your hall mates as you listen to your favorite songs in the middle of the Academical Village. This guy is always a hit. 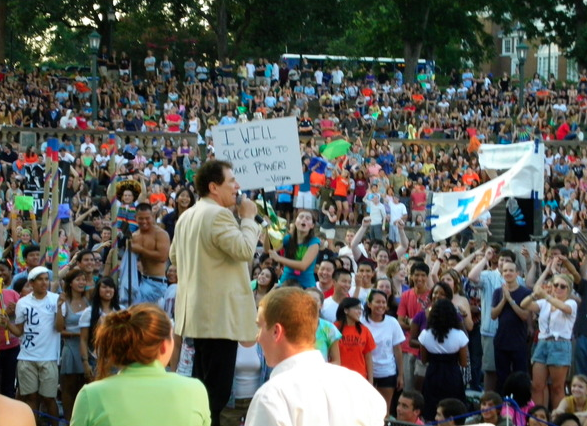 Every year a hypnotist performs in the amphitheater on one of the first weekends of the year. Students often dress up in crazy costumes to get his attention in order to be called onstage as a volunteer to be put to sleep, told to act like a chicken, or sing opera to their classmates. This year our first game is against Notre Dame on September 12. Tailgate on the quad with your dorm or on the Lawn with friends before making your way to Scott Stadium for the first game of the season. 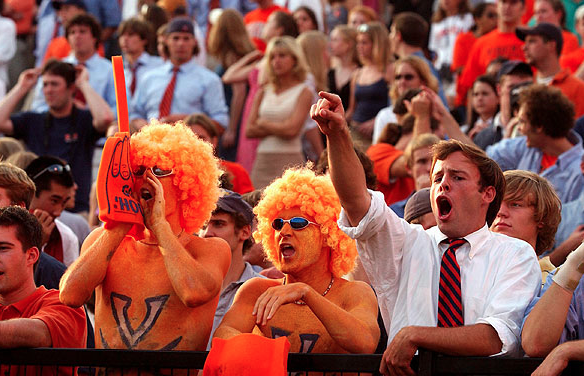 Many students will abide by the "Girls in Pearls, Guys in Ties" tradition, but wear whatever best shows your UVa spirit! Get there a few minutes early to catch the video featuring Cav Man's defeat of our opponent. Places to Shop in Cville! A lot of people just limit their shopping to the mall here at Charlottesville. The Fashion Square Mall is great and has a bunch of stores, but we have many other places scattered around Charlottesville that you cancheck out! Here’s a list of some popular locations to get a great outfit for a good price! 5. Spring Street: Located in Downtown Charlottesville (just hop on the Free Trolley) and founded in 2002, this boutique has an array of clothes from all over the country. The store is very intimate and the workers there are very helpful. This isn’t just a place for the ladies, there’s an array of options available for men as well. They have cute accessories as well as gift cards if you need a last minute present for someone! They unfortunately do not have a website, but check out their facebook page here. We've already told you about UVa's gyms, but if you prefer to workout in the fresh air there are lots of different routes to run on and off Grounds that allow you to explore the city of Charlottesville at your own pace (literally). Here are a few of the summer interns' favorite jogging paths for beginner or expert runners. As an Old Dormer, my most common route was Alderman Road. I'd walk to the front of Old Dorms, take a right onto McCormick and start jogging just before I turned the corner onto Alderman at the light by O-Hill. Where Alderman intersects with Ivy, I'd cross the street and run straight up past the baseball stadium and then turn right onto Massie and pass John Paul Jones arena before arriving at Emmett. Once on Emmett I'd jog back towards grounds, past Mem Gym, and cross the street by the Central Grounds Parking Garage to get back to dorms. Living in Lambeth last year, I loved running down Rugby and exploring the neighborhoods that branched off from the main road. Where Rugby intersects with Preston Ave (the light at the bottom of the big hill), I'd take a left and bear right to stay on Rugby until proceeding onto Dairy Road. I'd jog down the hill, across the bridge over 250, and do a slow lap around St. Anne's Road before arriving at Meadowbrook Heights Road and getting back on Dairy. This is one of the longer routes so I recommend running with a partner so you have someone to talk to and keep you motivated while you jog! My route starts with the Flats at West Village, my apartment complex off-grounds. I run down Main St./ University Ave. and take a left onto McCormack Rd. From there I run to Wilsdorf Hall and cut through to the football stadium and back to Alderman Rd. That leads back to Jefferson Park Ave. which connects back to Main St. making about a 3 mile loop. There is an entryway onto the Rivanna Trail at the end of Massie Road across from the North Grounds Gym and club sport fields. This segment of the trail goes behind Darden and ends up onto Leonard Sandridge Road and you can either cross the road and continue with the trail or end your run there. If you continue on this segment of the trail it ends up on Old Ivy Road. The trail is a good challenge if you want a little more nature in your running routine. Anyone who's ever tried to navigate the labyrinth that is SIS (UVa's Student Information System) knows how overwhelming it can be at first. In places with spotty wifi, certain pages might not load, links to desired pages often seem hard to find, and there's so much information on the site it's hard to understand what's important and what isn't as useful. To help you out, here are a few tips on how to use SIS to your advantage. This link is located under the "Academics" banner on the homepage of SIS. Clicking "My Academics" will take you to to a page that gives you access to your course information, number of credits (either transfer credits from high school or those you'll need to earn a degree from UVa), and unofficial transcript. For first year students, your Academic Requirements are probably most important. To view what courses you've taken (or credits transferred from high school) and those you need to take, click "View My Advisement Report" next to Academic Requirements (in bold at the top of the first box). Where can you find courses to fulfill those requirements? Class selection is often a very stressful process for incoming students, but it doesn't have to be. Although SIS does have a database of offered courses, most if not all students will use an alternative site, Lou's List, to find and select courses they wish to take in the upcoming semester. Lou's List make the course selection process very simple, categorizing courses based on major as well as area requirements in the respective schools. How do you enroll once you've chosen your courses? you can add courses to your "Enrollment Requests Shopping Cart" by clicking the tab that says "Enroll" on the homepage of SIS and selecting the appropriate semester in which you'd like to take those courses. Once you select a term, you'll be able to add as many courses as you'd like (no 15 credit limit here) to your "Shopping Cart." To add a course, simply type the 5 digit number (underlined and in blue) to the left of the course description on Lou's List. Adding courses to your shopping cart does not mean you are committing to a course nor does it mean you will be guaranteed access into that course. In order to enroll, you must click the white box next to the course in your shopping cart and then select "enroll" in the green box to the bottom right of the screen. If you're wait-listed for a course, but want to enroll in 15 credits while you wait to get into the wait listed course, you can select "swap" under the "Enroll" tab on the "My Academics" page. With the "swap" option, you can choose a course to drop should you get into that wait listed course. The course you've just been granted access to will then take the place of the course you chose to swap out. SIS can certainly be confusing, but don't stress! Spend a little time browsing the site and becoming familiar with the different tabs and links. Until then, this short guide should help you select and enroll in the classes you want to take!